When we read Romans 8:28-30, it becomes clear that God’s purpose for us is to become like Jesus. What may not always be clear as we travel life’s journey is that even when we cannot see His hand in our situation He is working on our behalf. The book of Hebrews states that God is a rewarder of those who seek Him diligently seek Him. Our part in all this is to trust in and seek God knowing that He is at work for our good no matter what our circumstances. 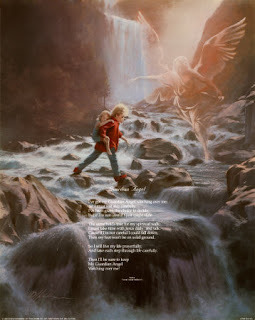 Artwork: Buyan and an Angel descend the mountain. 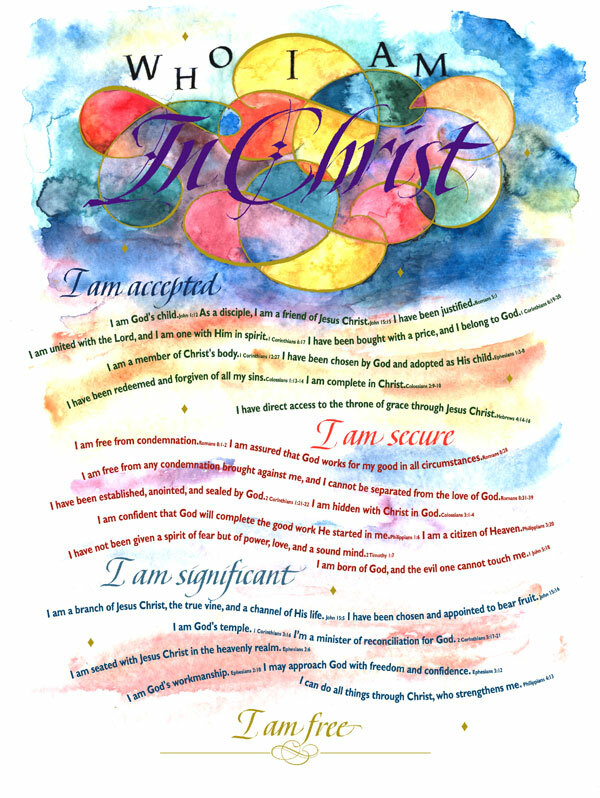 I am secure...In Christ, I am totally secure; I renounce the lie that I am guilty, unprotected, alone or abandoned. I am free from all condemnation. Security is a high priority in life. Life is much more enjoyable when we believe we are secure. It might be financial, emotional, relational, physical or spiritual but our sense of wholeness is damaged when we do not perceive that we have it. There is no more important security than in our life with God. Our spiritual health impacts all other areas in a far greater measure than we see in everyday life. Thank God that He has made us to be secure and our spirit to prosper and this opens the door for our (soul) mind and will and emotions to prosper which gives life to our physical being. 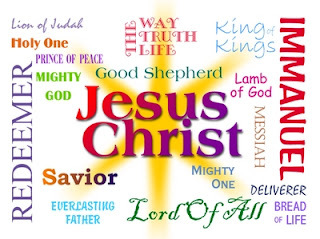 · 1 Corinthians 6:17 I am united with the Lord, and I am one with Him in spirit. The bride stood at the front of the church, holding tightly to her father's arm. She smiled shyly at the groom and looked expectantly toward the pastor. "Who gives this woman to be married to this man?" the pastor asked. The nervous father's reply was barely audible. He said in a trembling voice, "Her mother and I." Then he placed his daughter's hand gently in the groom's, kissed her, and wiped away a tear as he turned toward the pew where his wife was waiting. This scene has been replayed countless times in weddings from generation to generation. Traditionally, it is the parents who have presented the bride to the bridegroom. This was also true in New Testament times. In Jesus' day, a betrothal gift was given by the parents, and the bride was led to the groom's home in a procession (Matt 25:1-13). 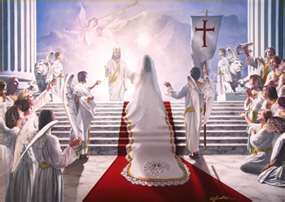 The scene will be slightly different, however, when the bride of Christ is joined to her Lord. At that time, according to Eph 5:27, the bride of Christ will be presented "as a radiant church" by Jesus Himself. In the original text, the term radiant literally means "glorious." Glory is one of the attributes of God. 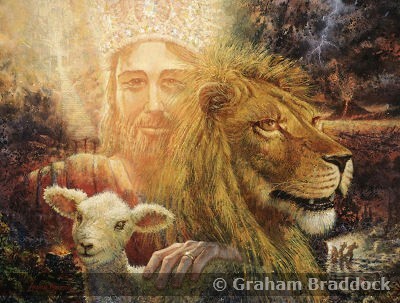 He is called the "King of glory" in Ps 24:7 and the "God of glory" in Ps 29:3. God shows His glory through what He has done. God's glory is evident in creation (Ps 19:1). According to Ps 96:3, He declares His glory among the nations through His "marvelous deeds." However, God's' glory is most clearly revealed in Jesus Christ (John 1:14). This glory was a reflection of the Father's glory, possessed by Jesus before the world began and fully restored to Him after His resurrection (John 17:5). 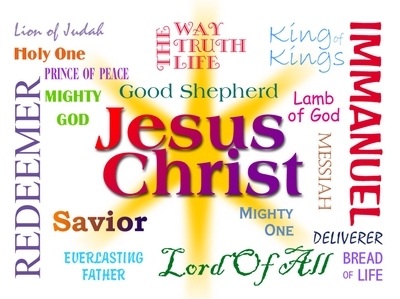 Jesus is: ". . . the image of the invisible God, the firstborn over all creation" (Col 1:15). God is protective of His glory (Ex 34:14). This is not because He is "jealous" in a human sense but because He is aware of His own uniqueness. In Isa 42:8, we are warned: "I am the Lord; that is my name! I will not give my glory to another or my praise to idols" (cf. Isa 48:11). Yet despite this, the Scriptures promise that when Christ presents us to Himself, we will share in His glory to such an extent that we will be glorious. This new status springs from two actions of Christ. It is rooted first in the fact that Jesus loved us with a love that was reflected in His actions when He "gave himself up" for us. This is the language of sacrifice and refers to His work on the cross (Eph 5:2). Secondly, Christ cleansed us "by the washing with water through the word" (Eph 5:26). Together, these provide the basis for our sanctification. Christ's death was a single and unrepeatable event that reversed the effect of sin and provided a righteous standing for those who had fallen short of God's standard. The washing of the word is an ongoing process that God uses to transform our minds and guide our actions, as we rely upon the power of the Holy Spirit to obey its directives. As a result of both, we will stand before Christ on the day of judgment genuinely holy and without blame, an unblemished bride who has no stain or wrinkle. It is important to note that what Paul has to say in this verse is more than abstract theology. These words provide the foundation for a very practical command: "Husbands, love your wives, just as Christ loved the church . . . ." The husband who would love his wife as God intended must have a clear understanding of the work of Christ. If he thinks of love in a purely worldly sense, he may look at this command and say, "I have loving feelings for my wife; I must be doing all right." Or the opposite may be true, and he may say, "I don't have any feelings for my wife, so I can't obey this command." In reality, though, biblical love is demonstrated in action. The husband who loves his wife as Christ loved the church will be available for her and sensitive to her needs. Availability means that his wife will have regular access to him. Unfortunately, his physical presence is not always a guarantee of this. A husband who is truly available has also learned how to listen and communicate. A sensitive husband understands the needs of his wife. He has learned how to live with his wife "in an understanding way" (1 Peter 3:7 NASB). Because the marriage bond reflects the relationship between Christ and the church, there is more at stake in our obedience to Paul's command than mere happiness (Eph 5:32). Ultimately, Christian marriage is a form of witness and a method of instruction. It provides a world that has been blinded by sin with a living analogy of the love of Christ. The bride is not the only one who is given away at the marriage ceremony. 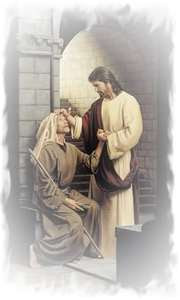 By promising to love his wife as Christ loves the Church, the groom gives himself to the bride. A cynic has called marriage an institution where "a man gives up privileges he never realized he had." In reality, the husband gives up much more. He gives up his very life. When Jesus loved, He gave up Himself. The husband who follows Christ's example can do no less. Lord Jesus, thank You for giving up Your life for me. Show me the opportunities You have placed before me today to follow in Your steps. I will give myself to You as I give myself to others. Amen. 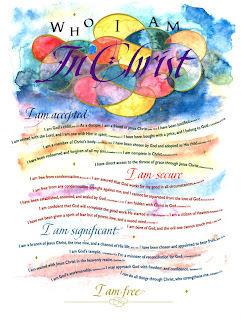 In Christ I am completely Accepted. I do not agree with the lie that I am rejected, unloved dirty or shameful. God says, As a disciple, I am a friend of Jesus Christ. We are truly favored by God because of Jesus Christ! Wow, talk about complete acceptance, being chosen and adopted by God is more amazing than any words I have. We are integrated into Christ as a part of His body we are integral to the accomplishment of His will and plans in the world in which we live. To me that is awesome beyond words! The reason for this is twofold. First, we should not be partners in this kind of behavior because it is displeasing to God (Eph 5:6). On a more fundamental level, however, we are to behave differently because we are different. Paul uses the contrast of light and darkness in Eph 5:8 to illustrate the difference between those who belong to Christ and those who do not. Throughout the New Testament, the present world is described as being in a state of darkness. For example, John 1:5 says that when the "light" of Jesus' life shone in the realm of darkness, it was not understood. Also, the world condemned itself by loving darkness more than light (John 3:19). And Jesus' enemies handed Him over to be crucified because they operated under the domain of darkness (Luke 22:53). Christ, however, has removed us from the control of this realm and transferred us into the kingdom of light: "For he has rescued us from the dominion of darkness and brought us into the kingdom of the Son he loves, in whom we have redemption, the forgiveness of sins" (Col 1:13-14). This darkness was more than an environment in which we lived prior to the entrance of Christ into our lives. According to Paul, before we trusted in Christ, we were darkness. The deepest core of our being was controlled by the power of sin. We may have been very religious; it is even possible that we lived a life of exemplary morality. The Bible says that Paul's own life before his encounter with the resurrected Jesus on the Damascus road was unparalleled (Phil 3:4-7). Unfortunately, all his moral achievements—even his own sincere desire to do right—could not change the fact that there was another influence in Paul's heart constantly working against his best intentions. He characterized this influence as "the law of sin" and wrote: "For in my inner being I delight in God's law; but I see another law at work in the members of my body, waging war against the law of my mind and making me a prisoner of the law of sin at work within my members" (Rom 7:22-23). The Cross has changed this. The light of Christ now shines in our hearts (2 Cor 4:6). We no longer belong to the darkness but are "sons of the light" (1 Thess 5:5). Since God is Himself light, our status as children of God obligates us to walk as children of light (1 John 1:6-7). According to Eph 5:8-9, this is a matter of producing the fruit of goodness, righteousness, and truth. The language of fruit bearing points to God's role in this process. We can walk as children of light because the Holy Spirit is at work reproducing God's own character in us. While the ability to walk in the light requires dependency upon God, we still must make a deliberate decision to do so. There is even an element of exploration as we "find out what pleases the Lord," a command that implies that such knowledge is not automatic (Eph 5:10). Paul literally says that we are to "test" the things that are pleasing to God. Fortunately, we have something more reliable than trial and error at our disposal for this. In order to bring to light the things that please God, we must have our minds renewed (Rom 12:2). The two primary instruments God uses to do this are the anointing of His Spirit and the teaching of His Word. The Holy Spirit functions as an internal instructor (1 John 2:20,27). The Scriptures provide us with a written record of what "pleases" God (1 John 3:22), and the internal testimony of the Spirit never contradicts God's written testimony. Both work in concert with one another in the believer's life. God has also gifted the church with individuals who have the ability to teach and whose ministry equips believers for obedience (Eph 4:11-12). Although we ourselves are no longer a part of the domain of darkness, we continue to have a responsibility to those who are. One of the chief characteristics of light is its ability to illuminate what is hidden in darkness. As children of light, we "expose" the fruitless deeds of darkness (Eph 5:11). This is what John the Baptist did when he reproved Herod for marrying his brother's wife (Matt 14:3-4). 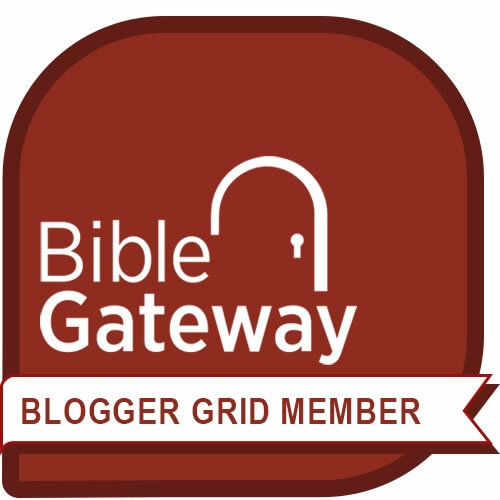 He uncovered Herod's behavior and revealed its true nature. Like John's preaching, a life fully committed to Jesus Christ can serve as a "wake-up call" to those who are still in the grip of darkness (Eph 5:14). It is easy to see how such a responsibility calls for discernment. When it comes to confronting others with their sin and their need for Christ, we have many strategies at our disposal. In some cases, direct confrontation is the best method. Others respond to mercy (Jude 23). We need to know how to make the most of each opportunity that comes along (Eph 5:15). The improper approach may cause us to squander an opportunity that will never come again. This kind of discernment can only come as insight from the Holy Spirit. Therefore, it is essential that we be "filled" with the Spirit (Eph 5:18). We have already received the Holy Spirit as part of our birthright as God's children, but we need to continually yield to His control (Rom 8:9). To help us understand how this works, Paul contrasts the influence of the Holy Spirit with that of wine. When someone becomes drunk on wine, there is a chemical reaction in the brain that results in a loss of control. The power to reason, the ability to react, and the capacity for self-control are all affected. The Holy Spirit affects these same areas, but in a different way. The Holy Spirit also operates on the mind, but the effect is rational and spiritual rather than chemical. The Holy Spirit affects the believer's ability to react and the capacity for reason and self-control. Instead of inhibiting these areas, as alcohol does, the Spirit stimulates them. It is the Holy Spirit who takes the knowledge we gain as we read the Bible and enables us to apply it to our circumstances. The Holy Spirit does not cause us to lose control but produces the fruit of self-control (Gal 5:22-23). Those who live as children of light also have a mutual responsibility to one another. They are to "Speak to one another with psalms, hymns and spiritual songs . . ." (Eph 5:19). These activities are congregational in nature. One implication of this command is that those who wish to be controlled by the Spirit also need to worship with God's people. This is a foundational principle in the Christian life. It is simply impossible to have a healthy Christian life while neglecting corporate worship. Even if we maintain our personal disciplines of prayer and Bible study, we still need to meet with God's people. Life in the Spirit will produce life in the body of Christ. Paul's command also underscores our need to be directed by the Holy Spirit when we gather for worship. It is important to remember that we serve as God's mouthpiece when we interact with others. 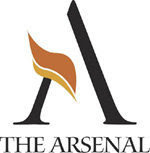 The Holy Spirit is also an important factor in the overall attitude of the church. A church full of grumbling and complaining is a hindrance to the gospel. It is unlikely that we will be able to attract unbelievers to Christ if we are constantly criticizing one another. We are called to live as children of light, but we are not called to do it alone. This responsibility is placed upon the whole church. Living as children of light is a group effort. Light of the World, shine through Your church in a way that will enable others to see our love. Help me to live as a child of the Light. Amen. I am united with the Lord, and I am one with Him in spirit. When we are born again our spirit is united with Christ Spirit in us. Our spirit is no longer at war with God and this brings us into a place of unity and acceptance with Him. I once heard it said that to be justified meant, ‘Just as if I never sinned,’ that is a pretty good translation. Jesus made it possible for us to be Accepted by God when he paid for our sins through His death and was raised to life by God the father. You are accepted by God and that is awesome! 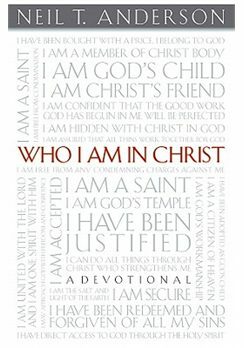 In this Devotional Anderson lays out the areas which communicate who we are in Christ. Each area has about 10 scriptures. As we go into the holidays we will shift out devotional to one scripture a day under these categories. In Christ we are Accepted, Secure, Significant and Free. In order for these to have an impact on us we must be In Christ. Before we have these new realities we must have a personal saving relationship with Christ. Today we will start the truth that In Christ I am completely Accepted. I do not agree with the lie that I am rejected, unloved dirty or shameful. God says, As a disciple, I am a friend of Jesus Christ. Today we will start the truth that In Christ I am completely Accepted. I do not agree with the lie that I am rejected, unloved dirty or shameful. God says I am a Child of God. In this Devotional Anderson lays out the areas which communicate who we are in Christ. Each area has about 10 scriptures. As we go into the holidays we will shift out devotional to one scripture a day under these categories. In Christ we are Accepted, Secure, Significant and Free. In order for these to have an impact on us we must be In Christ. Below is laid out the path we must take to be truly in Him. The following is from Anderson's site, the link for which is at the end of the article.